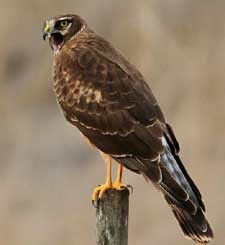 The Northern Harrier is distinctive from a long distance away: a slim, long-tailed hawk gliding low over a marsh or grassland, holding its wings in a V-shape and sporting a white patch at the base of its tail. Up close it has an owlish face that helps it hear mice and voles beneath the vegetation. Each gray-and-white male may mate with several females, which are larger and brown. These unusual raptors have a broad distribution across North America and Eurasia.